Are you ready for a radical money-management idea that's increasingly becoming more popular? Here's the idea, in two words: Save half. Save 50 percent (or more) of your after-tax income. Funnel these savings into ​building an emergency fund, aggressively repaying debt, and building your retirement portfolio. Yes, at first glance, this sounds like an insane idea. It's extreme. It's abnormal. But believe it or not, there's a small subculture of people who are saving half of their money. And they find that the peace-of-mind and flexibility that this generates is worth the effort. Many people achieve this on middle-class incomes. They may earn a take-home income of $100,000 per year, for example, and live on only $50,000 per year. Or they may earn $80,000 per year, but live on a household budget of $40,000. If you're a dual-income couple, the easiest way to save half is by living on one person's income while saving the other. Start by living on the higher of the two incomes. Spend several months adjusting to this budget. Once you're comfortable with this, later transition to living on the lower of the two incomes. By doing so, couples face an extra benefit: If you later decide to literally become a one-income couple, you'll be ready. Not only will you already be in the habit of living on one income, but you'll also have years of accumulated savings from your Save Half era. You will have also made major life decisions, such as your mortgage, from the perspective of paying for it via one income. If you're making a six-figure salary, saving half is much more attainable. If you're making $22,000 per year, however, it's not. At the lower end of the income spectrum, people are best served by earning more. This rapidly increases your power to save half, because you can throw every dime of that extra income directly into savings. When saving, start by targeting your three biggest expenses. For most people, this will be food, housing, and transportation. You may need to downsize to a smaller home. Some people have saved half by moving into a duplex or triplex, and living in one unit while renting out the others. The rent from the other units covers their mortgage, so they avoid having any out-of-pocket housing expenses. Since housing typically consumes 25 to 35 percent of the average household budget, this instantly allows them to reach the halfway point towards their 50 percent savings goal. If that's not appealing, consider downsizing into a smaller house or apartment. 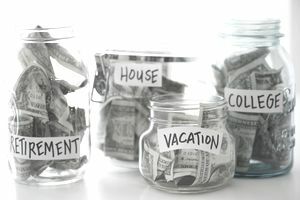 Not only will you save money on your mortgage or rent, you'll also save on utilities, furnishings and maintenance costs. Save money on transportation by living closer to work, driving fuel-efficient vehicles, and walking or cycling if possible. Save on food by cutting out restaurants and dining expenses. Consuming a mostly-vegetarian diet (or at least cutting out red meat) can also help you save on groceries. These three categories, alone, will generate a lot of traction towards the goal of saving 50 percent. When saving, don't forget about the 'invisible' expenses. It's easy to focus on groceries and gas because they're tangible. But people often forget about insurance premiums, mutual fund fees, and a myriad of other invisible and intangible expenses that create a big impact. Spend one afternoon per month reviewing your budget and asking yourself how you can trim these "intangible" costs that still consume from your bottom line.